Italian pianist Gabriele Baldocci is currently piano professor at Trinity Laban Conservatoire of Music and Dance in Greenwich, London. This release, with which he sets off on his complete recording of Liszt's celebrated transcriptions of Beethoven's Symphonies for Dynamic, coincides with the end of a successful tour of Argentina playing duets with none other than Martha Argerich. Liszt's transcriptions - which in fact hover somewhere between true reproduction and arrangement - have been recorded several times before, whether single Symphonies or whole cycles. Most infamous perhaps was the cycle by Glenn Gould, so idiosyncratic a pianist that his renderings sound like Beethoven arranged Liszt arranged Gould. In recent years, two fine cycles have appeared on Naxos, by the scandalously underrated Turkish pianist Idil Biret - available either on standard-issue CDs or part of their Idil Biret Archive (8.506027 is the complete boxed set) - and by the splendid Russian virtuoso Konstantin Scherbakov, likewise available separately or in a boxed set (8.505219). Some collectors will be lucky enough to own Leslie Howard's priceless 98-CD recording of Liszt's complete piano music on Hyperion (review), which includes all his Beethoven transcriptions, amounting to 8 discs. Earlier this year (2012), what promises to be another outstanding cycle got under way: Russian pianist Yury Martynov's for ZigZag (review). Martynov began with Symphonies nos. 2 and 6. Baldocci is saving no.2 for volume 2, which will be heard alongside no.7. As regards the present disc, Baldocci's Sixth is quite similar to Martynov's. Their timings are almost identical, and Baldocci matches both Martynov's virtuosity to tackle the phenomenal 'Storm' movement and his expressive maturity to put across the serenity of the 'Scene beside the Stream' in a soul-satisfying manner. 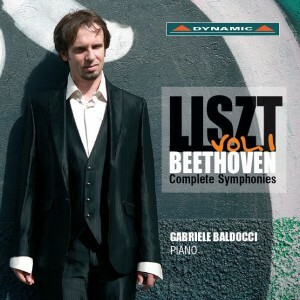 Baldocci nevertheless takes an intellectual approach to his music, researching the score in considerable depth to try to understand not just Liszt, but Beethoven too. He and Martynov may both want to re-record these works in a decade or two when they have studied, performed and listened to both composers long enough to achieve that goal, but in the meantime, their present recordings should entertain and satisfy in equal measure. In terms of style there is not much between them, at least after a debut volume. Retail pricing does little to separate them either, and in the end it may come down to the fact that Martynov's 1837 Erard piano has a better sound. Baldocci's will probably strike some as slightly harsh, not helped by a fairly narrow stereo. His model, by the way, is a Borgato L282 (1991), reputed to cost a quarter of a million dollars! The audio difference between the recordings is not massive, however. Robert Schumann's original reservations aside, critical opinion of these transcriptions has nearly always been very favourable. Liszt naturally held Beethoven in the highest esteem, and was very careful not to be seen trying to 'improve' upon his hero's genius, eschewing gratuity and bravura and going so far as to suggest fingerings to ensure clarity of parts. He does omit bits of detail here and there where he knows the piano cannot do justice to the layers of the orchestral original, yet most of the time his solutions to the substantial timbral difficulties arising from the transference of orchestra - especially Beethoven's - to piano range from the inspired to the miraculous. Dynamic's Italian-English booklet notes are no match for those that came with the Martynov Zig-Zag disc, but are certainly adequate.